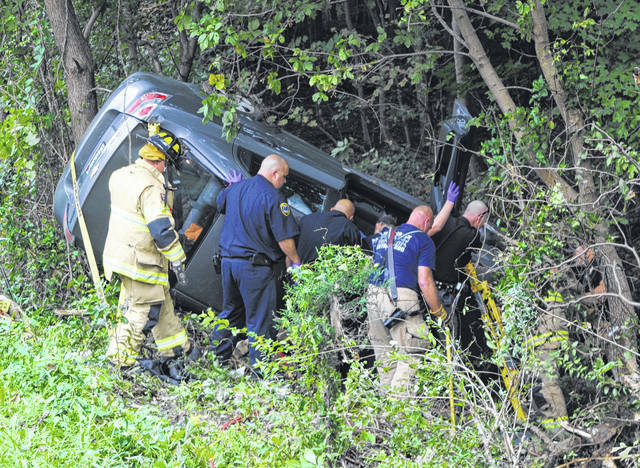 A 79-year-old woman had to be extricated from her vehicle and flown to the hospital Wednesday after her vehicle rolled onto its side, coming to rest on the brink of a ravine on the east side of Hillsboro. Sgt. Shawn Kelley of the Hillsboro Police Department said Ellen Ellis of Hillsboro was driving eastbound on Chillicothe Avenue in a gray Chevrolet Aveo when the vehicle reportedly drove off the right side of the road, struck a tree, rolled onto its top and ended up on its side with Ellis, the sole occupant, trapped inside. First responders had to secure the vehicle before cutting the car open and pulling Ellis out. Kelley said Ellis was responsive with emergency personnel. She was evacuated by medical helicopter to Kettering Medical Center, according to Kelley.